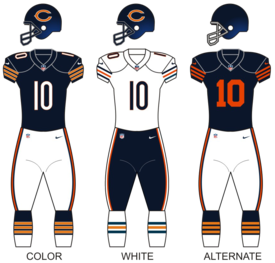 The Chicago Bears are a professional American fitbaa team based in Chicago, Illinois. Thay are members o the North Division o the National Football Conference (NFC) in the National Football League (NFL). The Bears hae wan nine (9) NFL Championships (aicht pre-merger, an ane Super Bowl). The Bears hauld the NFL record for the maist enshrinees in the Pro Football Hall of Fame, wi 27 members, an the maist retired jersey numbers (14). The Bears hae an aa recordit mair regular saison an oweraw victories nor ony ither NFL franchise. The franchise recordit its 700t win on November 18, 2010. ↑ "George Halas, Jr". Chicago Bears Official Website. Retrieved December 13, 2006. ↑ "Chicago Bears Franchise Encyclopedia". Sports Reference LLC. Retrieved August 15, 2008. ↑ "Green Bay Packers Franchise Encyclopedia". Sports Reference LLC. Retrieved August 15, 2008. ↑ "All-Time Win-Loss Records By Team". Pro Football Hall of Fame. 2008. Retrieved August 15, 2008. This page wis last eeditit on 5 Januar 2014, at 21:46.